This has been demonstrated beyond a shadow of a doubt by Ariane Burke, a professor in Université de Montréal's Department of Anthropology, and her doctoral student Lauriane Bourgeon, with the contribution of Dr. Thomas Higham, Deputy Director of Oxford University's Radiocarbon Accelerator Unit. In the absence of other sites of similar age, Cinq-Mars' hypothesis remained highly controversial in the scientific community. Moreover, there was no evidence that the presence of horse, mammoth, bison and caribou bones in the Bluefish Caves was due to human activity. To set the record straight, Bourgeon examined the approximate 36,000 bone fragments culled from the site and preserved at the Canadian Museum of History in Gatineau—an enormous undertaking that took her two years to complete. Comprehensive analysis of certain pieces at UdeM's Ecomorphology and Paleoanthropology Laboratory revealed undeniable traces of human activity in 15 bones. Around 20 other fragments also showed probable traces of the same type of activity. 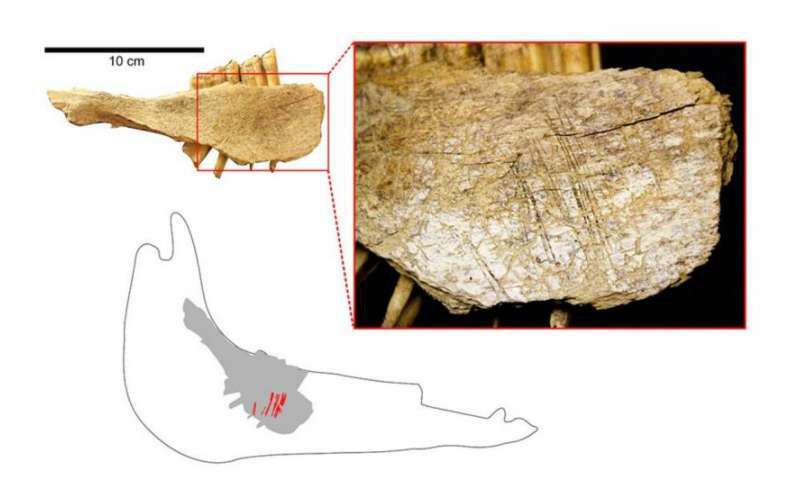 "Series of straight, V-shaped lines on the surface of the bones were made by stone tools used to skin animals," said Burke. "These are indisputable cut-marks created by humans." "Our discovery confirms previous analyses and demonstrates that this is the earliest known site of human settlement in Canada," said Burke. It shows that Eastern Beringia was inhabited during the last ice age." "Our discovery confirms the 'Beringian standstill [or genetic isolation] hypothesis,'" she said, "Genetic isolation would have corresponded to geographical isolation. During the Last Glacial Maximum, Beringia was isolated from the rest of North America by glaciers and steppes too inhospitable for human occupation to the West. It was potentially a place of refuge." The results of Lauriane Bourgeon's doctoral research were published in the January 6 edition of PLoS One under the title "Earliest Human Presence in North America Dated to the Last Glacial Maximum: New Radiocarbon Dates from Bluefish Caves, Canada." The article is co-authored by Professor Burke and by Dr. Thomas Higham of Oxford University's Radiocarbon Accelerator Unit, in the U.K. When modern mankind was newborn. A far piece from Africa. Hardly. H. sapiens goes back at least 200 000 years. And left Africa ~ 60 000 years ago. And were in Australia/ PNG by ~ 50 000 years ago. Awesome research by these researchers. I am so glad to see you stick to your guns and standing by your hypothesis against the mainstream. It is really difficult to do this these days. It takes a rare breed of people to do it and I commend you for your courage. Please keep up the good work.